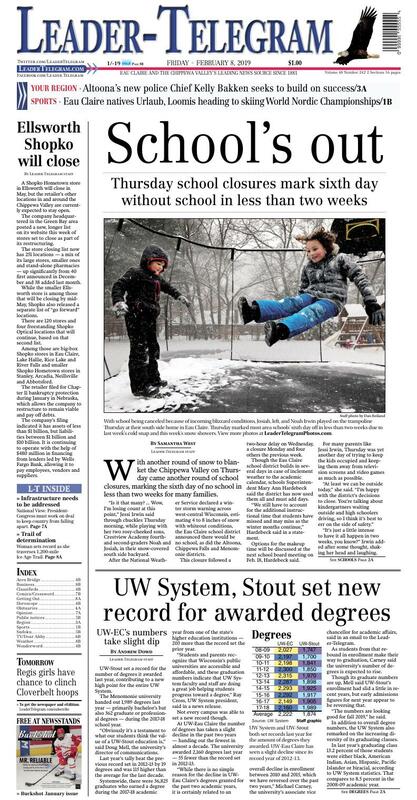 With another round of snow to blanket the Chippewa Valley on Thursday came another round of school closures, marking the sixth day of no school in less than two weeks for many families. “Is it that many? ... Wow, I’m losing count at this point,” Jessi Irwin said through chuckles Thursday morning, while playing with her two rosy-cheeked sons, Crestview Academy fourth- and second-graders Noah and Josiah, in their snow-covered south side backyard. After the National Weather Service declared a winter storm warning across west-central Wisconsin, estimating 4 to 8 inches of snow with whiteout conditions, the Eau Claire school district announced there would be no school, as did the Altoona, Chippewa Falls and Menomonie districts. This closure followed a two-hour delay on Wednesday, a closure Monday and four others the previous week. Though the Eau Claire school district builds in several days in case of inclement weather to the academic calendar, schools Superintendent Mary Ann Hardebeck said the district has now used them all and must add days. “We still have to account for the additional instructional time that students have missed and may miss as the winter months continue,” Hardebeck said in a statement. Options for the makeup time will be discussed at the next school board meeting on Feb. 18, Hardebeck said. For many parents like Jessi Irwin, Thursday was yet another day of trying to keep the kids occupied and keeping them away from television screens and video games as much as possible. “It’s just a little intense to have it all happen in two weeks, you know?” Irwin added after some thought, shaking her head and laughing. “Sometimes,” 7-year-old Josiah admitted, asked whether he’s been bored on some of the days off. Kids and parents aren’t the only ones beginning to get tired of Mother Nature’s winter frenzy of late. Without consistent school over the last couple of weeks, Brittany Pettis, a sixth grade special education teacher at DeLong Middle School, said it’s been difficult to get much accomplished in the classroom. Pettis recommended parents keep their kids reading, writing and thinking about numbers during breaks like this. “Anything like that is helpful so that when they come back it’s somewhat fresh in their minds,” Pettis said. North High School English teacher Andrew Patrie said in his 21 years of teaching, he cannot remember a year quite like this. Though the 2013-14 winter also had a cold snap that caused a similar amount of school cancellations, they weren’t strung together within such a short period of time, Patrie recalled. UW-Stout set a record for the number of degrees it awarded last year, contributing to a new high point for the entire UW System. The Menomonie university handed out 1,989 degrees last year — primarily bachelor’s but also 362 graduate or professional degrees — during the 2017-18 school year. “Obviously it’s a testament to what our students think the value of a UW-Stout education is,” said Doug Mell, the university’s director of communications. Last year’s tally beat the previous record set in 2012-13 by 19 degrees and was 115 higher than the average for the last decade. Systemwide, there were 36,825 graduates who earned a degree during the 2017-18 academic year from one of the state’s higher education institutions — 203 more than the record set the prior year. “Students and parents recognize that Wisconsin’s public universities are accessible and affordable, and these graduation numbers indicate that UW System faculty and staff are doing a great job helping students progress toward a degree,” Ray Cross, UW System president, said in a news release. Not every campus was able to set a new record though. At UW-Eau Claire the number of degrees has taken a slight decline in the past two years — handing out the fewest in almost a decade. The university awarded 2,160 degrees last year — 55 fewer than the record set in 2012-13. “While there is no simple reason for the decline in UW-Eau Claire’s degrees granted for the past two academic years, it is certainly related to an overall decline in enrollment between 2010 and 2015, which we have reversed over the past two years,” Michael Carney, the university’s associate vice chancellor for academic affairs, said in an email to the Leader-Telegram. As students from that rebound in enrollment make their way to graduation, Carney said the university’s number of degrees is expected to rise. Though its graduate numbers are up, Mell said UW-Stout’s enrollment had slid a little in recent years, but early admissions figures for next year appear to be reversing that. “The numbers are looking good for fall 2019,” he said. In addition to overall degree numbers, the UW System also remarked on the increasing diversity of its graduating classes. In last year’s graduating class 13.2 percent of those students were either black, American Indian, Asian, Hispanic, Pacific Islander or biracial, according to UW System statistics. That compares to 8.5 percent in the 2008-09 academic year. Both Chippewa Valley campuses have seen growth in the proportions of minorities graduating, but lag behind the university system’s average. UW-Eau Claire’s most recent graduating class had a 7.7 percent minority population, up from 4.2 percent a decade prior. Nonwhite students accounted for 8.6 percent of UW-Stout’s graduating class last year, up from 4.7 percent in the 2008-09 academic year. The most racially and ethnically diverse graduating class belonged to one of the system’s smallest campuses last year. Of the 783 degrees bestowed by UW-Parkside, 27 percent went to minority students. A Shopko Hometown store in Ellsworth will close in May, but the retailer’s other locations in and around the Chippewa Valley are currently expected to stay open. The company headquartered in the Green Bay area posted a new, longer list on its website this week of stores set to close as part of its restructuring. The store closing list now has 251 locations — a mix of its large stores, smaller ones and stand-alone pharmacies — up significantly from 40 first announced in December and 38 added last month. While the smaller Ellsworth store is among those that will be closing by mid-May, Shopko also released a separate list of “go forward” locations. There are 120 stores and four freestanding Shopko Optical locations that will continue, based on that second list. Among those are big-box Shopko stores in Eau Claire, Lake Hallie, Rice Lake and River Falls and smaller Shopko Hometown stores in Stanley, Arcadia, Neillsville and Abbotsford. The retailer filed for Chapter 11 bankruptcy protection during January in Nebraska, which allows the company to restructure to remain viable and pay off debts. The company’s filing indicated it has assets of less than $1 billion, but liabilities between $1 billion and $10 billion. It is continuing to operate with the help of $480 million in financing from lenders led by Wells Fargo Bank, allowing it to pay employees, vendors and suppliers.